Factory Sig Sauer P250/P320 Grip Module allows the shooter to tailor the pistol to meet their specific grip size requirements. Black polymer construction and comes with the magazine catch installed. 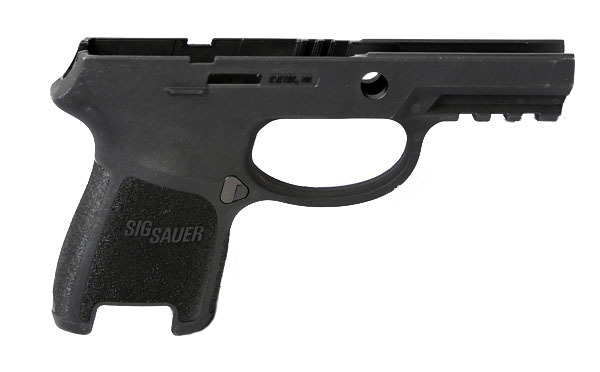 This is the medium grip for the 9mm, .40S&W and .357SIG P250/P320 Sub-Compact. Shipped the day after I ordered it and arrive quickly. Genuine item. Fits perfectly and fills the palm much better than the small grip that came on the pistol. Top Gun's website photo shows a "Gen.1" grip frame, but I was shipped a new style "Gen.2" grip which I fully expected. Because my wife's pistol is a Gen. 1, I had to order an updated slide catch lever in order to use this grip. I have no problem with that, except T.G. sells lever for $32.95. I ordered one directly from Sig Sauer for $10.00 plus 9.95 S&H. I definitely recommend this grip even for someone with small to medium size hands. First top gun stuff ship fast and has the best customer service. The grip fit perfectly with my FCU and was flaws, no tool markings. I would recommend this grip anyone using a medium in any other size. Fast and professional service, I highly recommend Top Gun Supply. This company has outstanding customer service and prices to match. Shipping is fast . Will be back again! As always fast and reliable delivery from Top Gun. I replaced the frame from a 9mm P250 SC without a rail with this and expected to have to buy a new custom holster, but to my surprise this frame fits my custom holster for the old frame perfectly. I am impressed. However I will still need a new custom holster for this unit now with a small light.